The funeral procession for Kim Jong-Il was carried out with military precision and when a handful of dawdlers messed up those regimented lines, they were eliminated. From the photo, that is. A photo released by the North Korea's state news agency and transmitted by the Germany-based European Pressphoto Agency is slightly different from a photo taken at nearly the identical moment and released by Japanese agency Kyodo News. The Japanese picture captured a half-dozen men near a camera on a tripod lingering behind the line of mourners on the left side of the boulevard as the motorcade passed by. 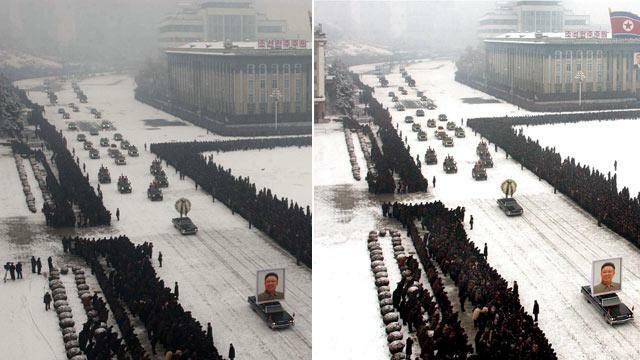 In the photo by the North Korean Central News Agency, those men, their camera and their footprints have been digitally removed, restoring absolute order to the crowds lining the boulevard as the cortege passed by. The alterations were discovered by the New York Times with the help of digital forensics expert Hany Farid of Dartmouth College. The European Pressphoto Agency, which distributed the doctored North Korea photo, issued a "mandatory kill" for its clients, meaning they were not to use the picture. The agency granted an exception to ABC News "for the sole purpose of being able to show and explain what had been altered before the picture was provided to international news agencies by KCNA [North Korean Central News Agency]. We consider this as part of a transparent and responsible clarification process." A European Pressphoto Agency spokeswoman told ABC News, "Any kind of digital manipulation violates EPA's code of ethics."